In League, Program means the issues that we choose for concerted study, education and action at local, state and national levels. Program can include both education and advocacy work. It takes the enthusiasm and interest of our members to keep our program vital. You’d never skip voting in an election; you shouldn’t skip the League’s equivalent. The program planning process is your voice! The Issues for Emphasis (priority issues) your League proposes as priorities may be based on current League work or on new topics you believe we should focus on. Members shared their voices on issues that matter most and areas to focus on in 2019-20/21. Thanks to those of you who attended a productive Program Planning event on February 23. This event helps us plan how to focus our energies in the next League year. A full report will be available in our upcoming April Issue of the VOTER. You can view the materials that were used to prepare for the Annual Planning Meeting as well as the PowerPoint (pdf) that was used during the presentation. Members will vote on the issues for emphasis recommended by the Board at our Annual Meeting on May 11, where you will also vote on next year’s leadership and the budget. Please be sure to 'save the date' on your calendars and stay tuned to further details on location and timing. Link to PowerPoint used at the Event. The National Program for the League of Women Voters of the United States occurs every two years, on even years. Work is managed by the League of Women Voters of the US Board of Directors and national staff. ​​ Local Leagues share their top issues with the National League and these issues are then put to vote at the National Convention by the delegates who attend from each state and local League. The issues voted on by these delegates then become part of the priority issues and the recommended program for the National League. 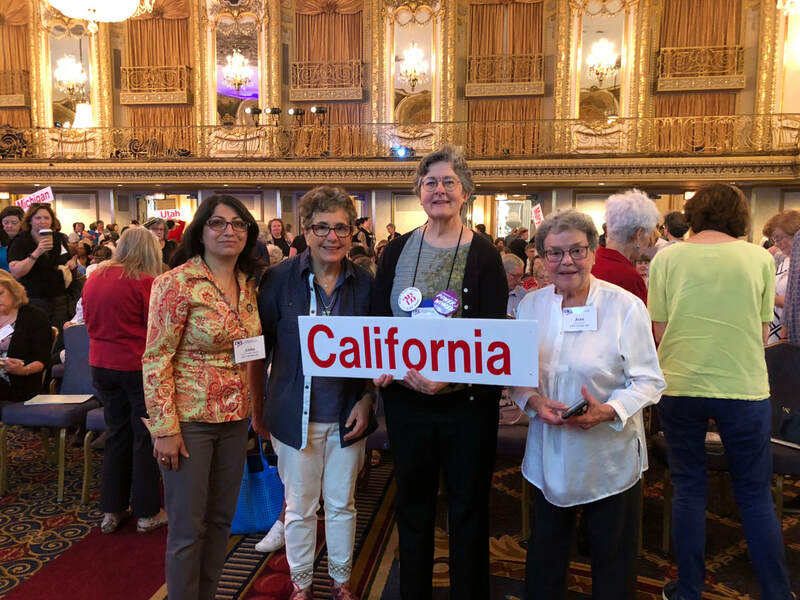 The State Program for the League of Women Voters of California (LWVC) is held every alternating two years, on odd years. The program issues prioritized from each local League are shared at the State Convention typically at the beginning of the summer (June/July), and voted on by the delegates from each League. The program planning process culminates in the delegates’ adoption of the statewide program. A strong program planning process leads directly to Convention, where priorities are set from both a policy and a budgetary standpoint. LWVC board members carefully consider the input from League members as they formulate the recommended program for the State League. ​Learn more about our current Local and National Programs and current areas of focus. Here is a wonderful Episode from the 'What would Alice Paul Do' Podcast on LEAGUE LINGO. Program Planning and more is explained!